Cool AVI DIVX to All Video Converter is professional software which can help you convert AVI, DIVX video files to all other popular video formats. It supports converting AVI, DIVX to almost all video formats including MP4, WMV, VCD, SVCD, DVD, 3GP, iPod, iPhone, Zune, Xbox, PMP, PSP, Apple TV, Pocket PC, FLV, SWF and MOV. It can help you play your WMV, ASF video on your MP4, iPod, iPhone, Zune, PMP player easily. Convert AVI/DIVX video files to all popular video formats with high speed. ...... PMP player easily. It has easy-to-use interface and can convert video files at high speed. * Support converting AVI, DIVX to MP4, WMV, VCD, SVCD, DVD, 3GP, iPod, iPhone, Zune, Xbox, PMP, PSP, Apple TV, Pocket PC, FLV, SWF and MOV formats. * Support batch conversion, so you can convert a number of video files at the same conversion settings at one time. Convert AVI, WMV, MPEG, MP4, ASF, VOB, 3GP, iPhone, MOV, FLV to AVI/DIVX format. 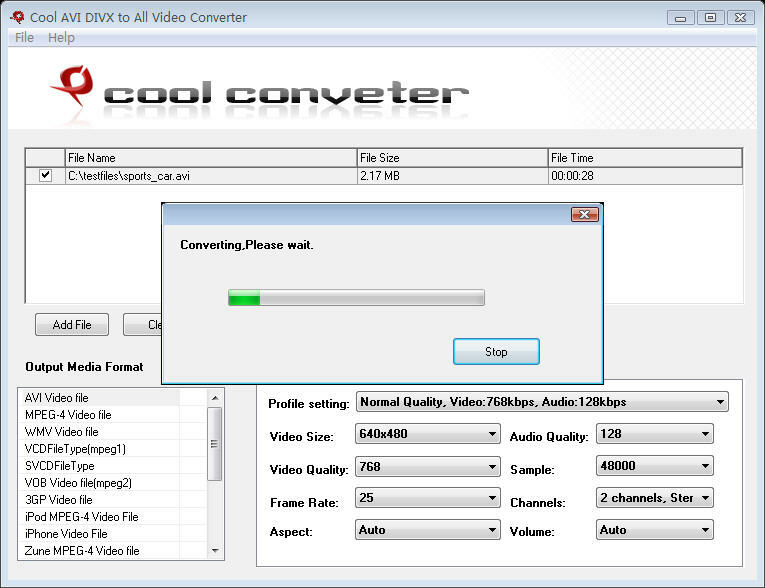 Is a small and effective solution for video file conversion. convert AVI, WMV, MPEG, MP4, ASF, RM, MOV to AVI DivX Xvid video clips fast. Converter from AVI to RM video files. It supports batch conversion. Convert WMV (ASF, ASX), MPEG (MPG), VCD to AVI format. Convert AVI, WMV, MPEG, MP4, ASF, VOB, 3GP, iPhone, MOV, FLV to MOV format. Convert MOV video files to all popular video formats with high speed. Convert AVI, WMV, MPEG, MP4, ASF, VOB, 3GP, iPhone, MOV, FLV to WMV format. Convert AVI, WMV, MPEG, MP4, ASF, VOB, 3GP, iPhone, MOV, FLV to iPod format. WMV to AVI Video Converter converts video files between all popular formats. Qweas is providing links to Cool AVI DIVX to All Video Converter 6.0 as a courtesy, and makes no representations regarding Cool AVI DIVX to All Video Converter or any other applications or any information related thereto. Any questions, complaints or claims regarding this application Cool AVI DIVX to All Video Converter 6.0 must be directed to the appropriate software vendor. You may click the publisher link of Cool AVI DIVX to All Video Converter on the top of this page to get more details about the vendor.